This October, we will be celebrating the 10 year anniversary of the original AdventureQuest. It brings a lot of joy to my heart knowing that those players who supported us all that time ago are still able to enjoy a new release every week in that game. I will be honest... when we released our 2nd game, DragonFable, we were scared. The players were too. We had no idea what would happen. A lot of people said we would fail. (Thank you for proving them all wrong.) The people who believed in us and supported DragonFable during the 1st month by upgrading their accounts became known as "Founders." We were VERY grateful. Those who have the title of "Founder" for one of our games receive a massive amount of respect (and some very impressive exclusive rewards in-game.) Founder was a once in a lifetime opportunity in DragonFable. Those who missed it... would never be able to get it again. Ever. When we announced we were making our 1st MMO, AdventureQuest Worlds, again... there were many nay-sayers. Especially because we had to change how we priced the MMO due to the more expensive servers, bandwidth and costs of running the game. You believed in us and proved all the nay-sayers wrong... again :-) Those who supported us in that first month became the "Founders" of AQWorlds! ...and we went on to create the hottest Fantasy Flash MMO in the World together. If you have ever played, you know the weight the title Founder carries. 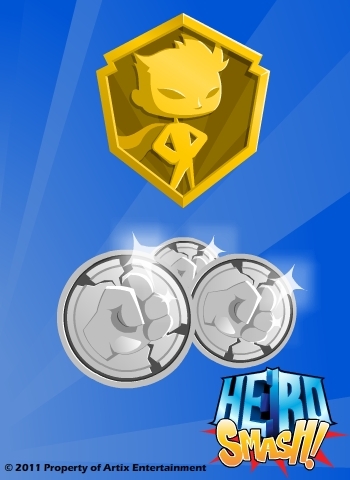 Our brand new game, HeroSmash is just about to launch. Whether you are a Founder in our previous games, or have missed the previous opportunities... this is your once-in-a-life-time chance to gain the title of "Founder" of HeroSmash! How can you become a Founder? Support HeroSmash and the team with an upgrade, re-newal, or SmashCoin purchase during the first 30 days of launch. Like Founder for our other games, this opportunity will never be available again. Like our first MMO, HeroSmash will have Membership and a secondary in-game currency called SmashCoins. "Best news EVAR!" It is official (now that Captain Rhubarb has it 90% working and we are pretty sure it will be ready and tested before next Thursday) we are upgrading all AQWorlds Memberships to "VIP* Memberships" which will give you FULL Member privileges in both AQWorlds & HeroSmash! Yes. You read that right. 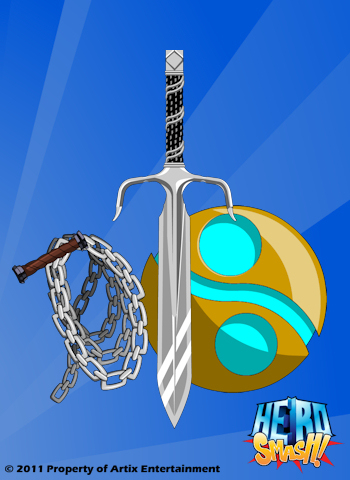 If you are a Member of AQWorlds *ding* you are a Member of HeroSmash too. Really. Totally serious. Sure, you might think we are out of our minds. But look at it this way. 1.) No one wants to pay for BOTH AQWorlds and HeroSmash Memberships at the same time. 2.) It is a cool way of saying thank you for supporting us! WOW! How can I become Founder? A pre-existing Membership will not get you Founder -- since the concept of Founder is for those who support the game at launch. The only way to become a Founder is to support HeroSmash with a new HeroSmash upgrade, re-newal, or SmashCoin purchase during the first 30 days of launch. (BETA LAUNCH begins next Thursday - April 28th) You can upgrade using any method available on the Artix Entertainment portal site: http://portal.battleon.com/store/points/ including pre-paid game cards from stores and even the current Netflix offer which would give you enough points to cover a $19.95 package. There will be a badge on your character page as proof that you are a Founder - The reason this game is possible. This will be the only opportunity to become a Founder of HeroSmash. Once it is gone, it will never be available again.